Could it be that a recently uncovered document once thought lost forever in the archives of the Kidologist’s vast children’s ministry vault of hand written resources from before the dawn of the computer could reveal a ministry strategy that could revolutionize your ministry today? 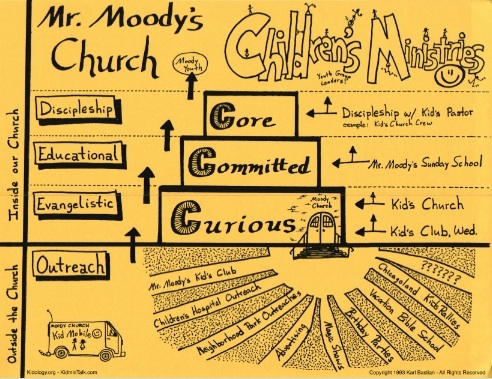 Archeologists have discovered a hand drawn ministry strategy document dating back to circa 1993 from when Karl Bastian, aka “The Kidologist,” was just a “Green Thumb” children’s pastor at the historic Moody Church in downtown Chicago. Yet this ministry strategy has been guiding his ministry for over twenty years. Once guarded as a valuable treasure and only shared with the most trusted colleagues, Karl has now revealed its secrets on his podcast. Will clues within this ancient drawing lead you to gold or a national treasure? Or will it simply make your ministry programing and event planning more strategic and purposeful? You be the judge. Listen to Kidmin Talk #53 today… and download the full resolution historical document for yourself. Discover the secret that will set your ministry planning on a whole new Quest!